Dental implants aren’t anything new in the world of tooth replacement, but they’ve never been better at replacing missing teeth than they are today. In fact, modern dental implants are the most effective method for completing a gapped smile. They are tiny titanium screws that act as prosthetic roots to support the tooth replacement that sits on top. Your dentists at D’Amico and Mauck DDS offer restoration of dental implants in Aurora, CO. Keep reading to learn about this fantastic option in tooth replacement! 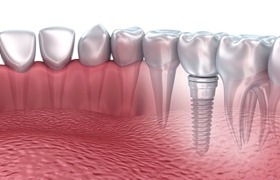 Dental implants are small devices -- sort of like little screws -- that are inserted directly into the gumline to support a crown, bridge, or denture. A crown is used to replace a single missing tooth, while bridges and dentures replace multiple or a whole row of lost teeth. With prosthetic roots, your jawbone has the stimulation it needs to stay healthy and whole, and your new teeth have the security to stand firmly in the gums. Dental implants restore your ability to eat, speak, and smile without the stress or worry of missing teeth or an ill-fitting denture. Once it’s been determined that you are an ideal candidate for dental implants (see “candidates for dental implants” below), your dentist at D’Amico and Mauck DDS will refer you to a trusted, local oral surgeon to perform the initial implantation. This procedure involves opening the gum, inserting the dental implant, then closing the space to allow healing to begin. The recovery portion of dental implants is vital to the success of your new teeth. It’s a process that takes anywhere from four to eight months to complete, depending on the location of the missing teeth and the health of the jawbone upon implantation. During this time, the bone and implant will gradually fuse together to form one solid unit. After this process (known as osseointegration) is complete, you’ll return to D’Amico and Mauck DDS for the restoration of your dental implants, or when the new tooth replacement is bonded or attached on top. A connecting abutment provides a link between the prosthetic device and the dental implants beneath. To determine whether or not dental implants are a good option for you and your smile, your implant dentist in Aurora will consider two things. The state of your jawbone: Successful dental implants require plenty of existing jawbone structure for anchoring. Without it, osseointegration may not occur, leading to implant failure. 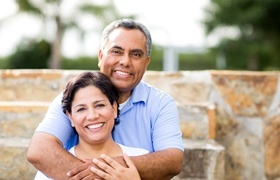 Bone grafting may be an option for patients who do not have enough supporting bone tissue. Your overall health. 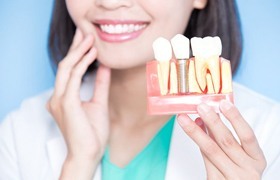 Patients should be able to undergo surgery in order to be considered for dental implants. This factor may preclude those suffering from uncontrolled diabetes, HIV/AIDS, and advanced cancers. Non-implant supported tooth replacements should be considered for these patients.